Hitting right notes: Loretta Anderson, from Regents Park, stands in front of the shelf holding her 471 compositions, which she said are gifts from God. MOTHERLY love became the stepping-stone that inspired Regents Park Catholic Loretta Anderson to pen 471 hymns over the past 32 years. 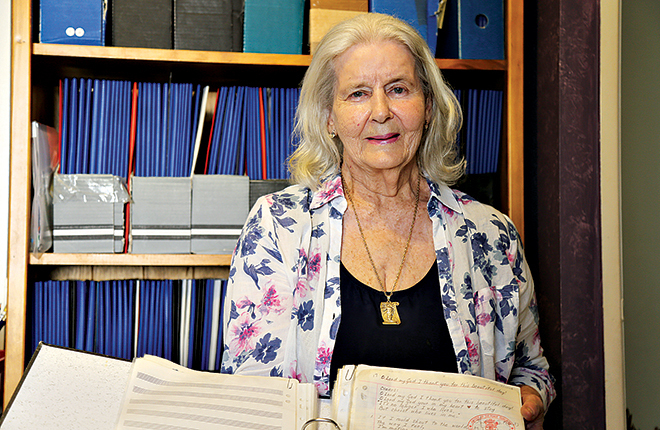 Ms Anderson has 471 unpublished songs accompanied by journal entries on her life’s trials and triumphs gathering dust on a shelf in her home office. Her compositions include hymns of healing to express how her own mother encouraged her to find hope in dark times, and believes it is time for the world to sing them. “I started off from brokenness,” Ms Anderson said. “Mum and my dad, I didn’t have the father as growing up; he left, I’m not sure what happened but they parted and he went off and started another family. “Mum didn’t have that blessing or that love – she was an absolutely beautiful lady but it wasn’t so easy for her. The talented musician knows how to tinkle a piano, stretch an accordion, and march her way on the organ, but it was through divine inspiration she began writing hymns. Ms Anderson penned her first hymn in 1982, and said she received music and lyrics from the Holy Spirit while waiting for news of her sick Italian husband, who was the reason she left the Anglican Church to become a Catholic. Marist Father Jack Soulsby is one of Ms Anderson’s fans, and wrote a letter congratulating the aspiring published musician on her works, all inspired by God. “I hear the music and then I go and put it to there and the words come with it,” she said. After 31 years, Ms Anderson said the time was right to look at publishing her work, and she has applied for a grant from the Brisbane archdiocese to publish her songs. “What has happened, and I believe it was closed for a reason, because the doors were always closed,” she said. She also believes she is called to take her music to the Middle East. Ms Anderson said her call was “springtime evangelisation” and developing “new wine skins”.